Last week 5C received a very important letter from Kensington Palace, London. 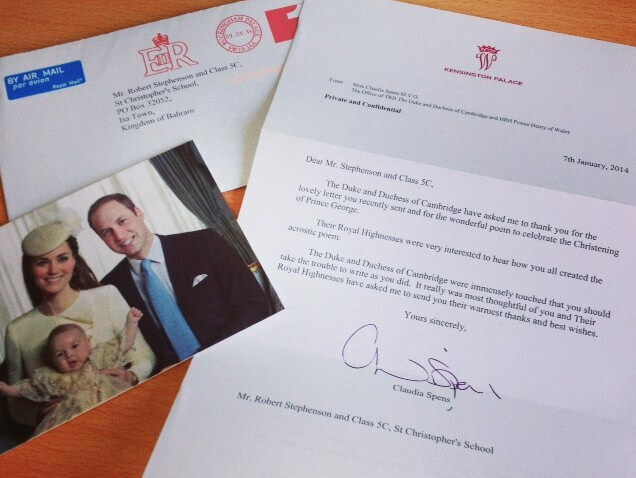 It was to thank us for a poem we sent to celebrate the Christening of Prince George, son of TRH The Duke and Duchess of Cambridge. The children were obviously very excited (as was I) and we wait with anticipation to see the letter, photograph, and our poem framed and placed somewhere prominent in the school. As part of one of our poetry lessons into the use of poetic techniques, we learnt to write a line for the acrostic poem. Everyone wrote one line each. Can you see what it spells? England will be filled with glory when he reigns!